Gilda’s “Caro nome” in Rigoletto is a delightful aria that can easily become excruciating. It’s on the delicate side, naturally enough: a young girl in her first crush, musing on the boyfriend’s name in the Bel Canto language of vocal arabesque. For the public, it’s appealing in the way young love and agile soprano voices are always appealing, and at the same time poignant because we know the name is fake and the boyfriend does not mean well. But its delicacies can wilt like a fussy house plant without the right nutrients. The danger lies in the music’s built-in qualities of tentativeness and dreaminess - lines punctuated by rests, many places to stop the motion for a bit of vocalise, delicate high attacks, and so forth. If an already light voice picks its way too carefully through this music, ornaments can become vague distracting flutters, lingering can drift into directionless hesitancy, pianissimo can become undernourished “marking,” and by the end (the cadenza sometimes fractures into six or more separate cautious gestures) we may think Gilda’s problem is not heedless teenage passion but low blood sugar. This week’s record is a version I like for capturing all the delicacy while still letting us believe that it is basically an expression of enthusiasm. 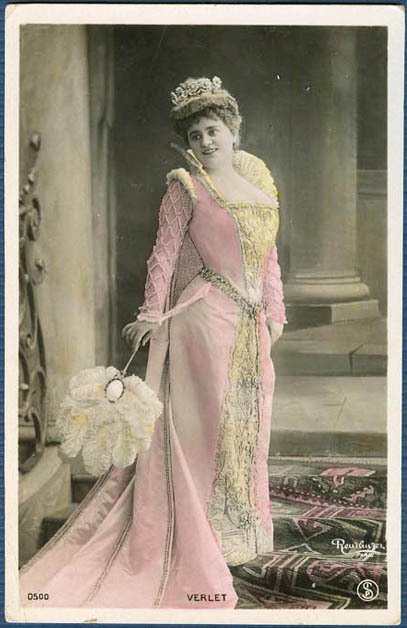 Alice Verlet (1873-1934) was a Belgian soprano trained by yet another member of the vast Italian operatic diaspora, a certain Mme. Moriani, born in Venezuela to a Sicilian father, briefly successful as a prima donna, then prominent as a teacher for at least four decades in many cities, including Brussels at just the right moment to find a sixteen-year-old Alice Verheyden there. In four years the pupil was ready for a professional debut in Leuven, and a year later, equipped with the stage name by which we know her now, she reached the Opéra-Comique as Philine in Mignon. She became a favorite in Paris and her career quickly turned international, reaching England in 1895 and the U.S. the following year. She seems to have been more a connoisseur’s singer than a reigning diva, but the New York Times reported in 1904 that Adelina Patti, no less, had expressed admiration for Verlet’s Gilda (and had congratulated Moriani on it). Verlet sustained her career in first-rate theaters through 1920 and continued a while longer in concerts before retiring to teach in her turn. Along the way she made about 80 records for four different companies, including “Caro nome” in all four series - thrice in French, once in Italian. This is the first, made for A.P.G.A. 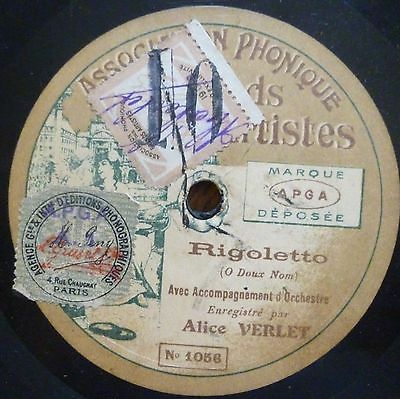 (the Association Phonique des Grandes Artistes, a singers’ collective founded to make sure the profits went to the people the customers were paying to hear), plus a fragment from the last (including eight bars cut from earlier versions in deference to time-limits that the Edison company had learned to extend). There’s a lot to admire here. The tone itself, once one has learned to listen through the limits of the primitive sound quality, is delicious. If it were a sweet dessert it would be more like candied citrus than creamy mousse. The frequent descents to the keynote (many phrases start or end on it) benefit from firm low-register grounding. Instead of constant random swells and retractions, we get a few well-judged crescendos and diminuendos within a steadily drawn line. There is a really expert messa di voce on high B near the end. At each cadenza pause (including the one heard only on the Edison fragment), Verlet holds the starting note and then runs to the goal, which does a lot for the enthusiasm factor. Another musical detail worth reviving: the six short trills between 0:50 and 1:15, which are often either vaguely sketched or omitted, work best when they’re given some extra time to blossom, as Verlet does. That was standard practice - here are fragments as sung by Verlet (in yet another of her recordings), Evelyn Scotney, Emilie Herzog, and Eugenia Bronskaya - and it applied to melodic trills everywhere, not just in this aria.